A new update for GWENT: The Witcher Card Game is now available on PC! 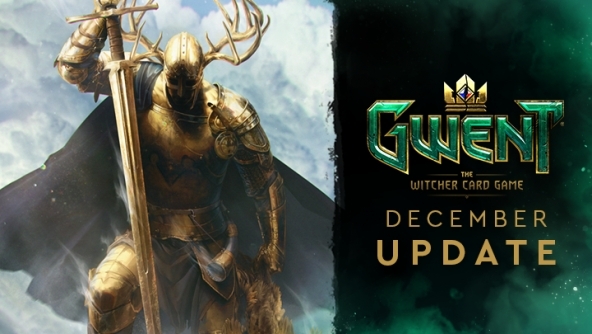 This update signifies GWENT’s official release on consoles coming later today (you can find the overview of changes specific to the Homecoming Update here) and introduces multiple balance changes in addition to bug fixes for all platforms. With the December 2018 Update, we’re focusing on fixing game balance issues, squashing bugs and introducing a few “quality-of-life” improvements on the UI side. Notable changes include updated abilities for Xavier Lemmens and Wolfsbane as well as balance changes for the Leader abilities of Morvran Voorhis and Eithné. We believe that these changes will lead to a more diverse meta and lessen the number of “auto-include” cards for certain decks. The cards on the list, when milled, will create an amount of scraps equal to the amount of scraps needed to craft a card of the same value. It is now possible to see which cards remain in your deck by clicking on it. Cards will be shown in a random order. The recruit cost of cards is now visible when opening kegs. Cards can now be filtered by their type in the Deck Builder. Card set naming has been standardized. It is now possible to click the left arrow in the keg purchase window to show the maximum number of kegs one can claim with their available Ore.
Xavier Lemmens: recruit cost changed from 8 to 10; ability changed to "Deploy, Melee: Banish up to 3 cards in enemy graveyard. Ranged: Banish up to 3 cards in your graveyard." Geralt: Igni: ability changed to “Deploy, Melee: Destroy the highest unit(s) on an enemy row with a total of 20 or more power." Fixed an issue whereby Botchling’s power resets after transforming into Lubberkin. The Poor Man's Gwent contract can now be completed with a deck that has a total recruit cost of 100 (the description will be adjusted at a later time). Fixed an issue whereby a card in the opponent's hand would sometimes become revealed to the player. Fixed an issue whereby units played by the opponent from a graveyard sometimes appear face-down. Fixed an issue whereby Tainted Ale's ability could not be used if there was only 1 unit on the board. Fixed an issue whereby Nilfgaardian Knight would destroy itself if the only enemy units on the board had the Immune status. Fixed an issue whereby Johnny, Sarah, Impera Enforcers, and Myrgtabrakke would not receive Charges from cards that grant them. Fixed an issue whereby using Whispering Hillock on a unit on a full row would prevent the Spawned unit from being placed on that row. Fixed an issue whereby units with Immune would lose that status after being played from graveyard. Wild Hunt Hound can now recognize whether it is the highest unit, thus enabling its own conditional ability when appropriate. Adda: Striga can now recognize whether she is the highest unit, thus enabling her own conditional ability when appropriate. Count Caldwell can now recognize whether he is the highest unit, thus enabling his own conditional ability when appropriate. Fixed an issue whereby Sabrina Glevissig could damage units in hand if her Deathwish was triggered by Ritual Sacrifice. Roach will no longer be Summoned when the opponent plays a gold unit on the player's side or plays a card from player's deck. Fixed an issue whereby Isbel of Hagge and Stregobor could grant a card that exceeds the hand limit. Fixed an issue whereby Sweers' damage would not increase if he was put back in the deck during Redraw phase then played after units were Revealed. Fixed an issue whereby Cahir’s ability would not trigger after the opponent's Ghoul received a boost from Consume. Fixed an issue whereby Hubert Rejk would sometimes not receive a boost if played via other cards. Fixed an issue whereby the opponent's Pitfall Trap would destroy a unit with Deploy if Ointment was used on that unit. Fixed an issue whereby Impera Enforcers would not gain Charges when a Spying unit was played from the opponent's graveyard. Fixed an issue whereby Sabrina Glevissig’s Deathwish ability would not trigger if played via Hanmarvyn’s Blue Dream and destroyed during the same turn. Fixed an issue whereby Drummond Warmonger could destroy Tactical Advantage. Fixed an issue whereby using Toruviel’s ability on a row could prevent other cards’ row effects from targeting that same row. Milva no longer receives a boost if the opponent plays Elf units via Hanmarvyn’s Blue Dream. Fixed an issue whereby Milva would receive boosts from Scoia'tael artifacts. Fixed an issue whereby Farseer's ability would trigger when played on Melee row. Fixed an issue whereby Ceallach Dyffryn and Lock abilities would not remove Doomed statuses. Fixed an issue whereby Spawned units with Order abilities would not receive Zeal from John Natalis. Fixed an issue whereby Combat Engineer would receive a boost if the opponent controlled an artifact but the player did not. Fixed an issue whereby the Cooldown of Pavko Gale’s Order ability would refresh after his owner played a Trap card. Fixed an issue whereby Pavko Gale could not target allies. Fixed an issue whereby Standard Bearer would boost an ally after being Revealed by the opponent. Fixed an issue whereby Saskia was able to target Immune units. Fixed an issue whereby the turn counters of Biting Frost and Impenetrable Fog would not decrease if no units were present on the affected row. Elven Scout no longer receive two boosts from Traps that are activated by their Order abilities. Nauzicaa Sergeant no longer receives boosts for Deploy abilities triggered by Vrygheff and Ointment. Nauzicaa Sergeant no longer receives a boost when the opponent plays a unit with Deploy via Hanmarvyn’s Blue Dream. Yaevinn no longer counts himself for his ability. Fixed an issue whereby special cards created by Aguara: True Form would not trigger the abilities of units that are triggered by the playing of special cards. Fixed an issue whereby allowing the turn timer to expire with the last card in hand would end the match incorrectly. Fixed an issue whereby a match could end incorrectly if a copy of Ciri created via another card's ability returned to the player's hand. Fixed an issue whereby Dagon's card preview could appear in an active match and block further actions by the player. Fixed an issue whereby not selecting a card with Assire var Anahid and letting the turn timer expire would block further actions by the player. Fixed an issue whereby Leader skin selection could not be confirmed when using a controller. Fixed an issue whereby Friend Match invitations could not be sent in certain circumstances. Fixed an issue whereby a plugged in joystick or racing wheel could break mouse input. Fixed an issue whereby the "Open" button would disappear from “Open Goodies” window. Fixed an issue whereby kegs could sometimes not be opened with the "Open" button. Fixed an issue whereby a question mark item appeared in the "Open Goodies" window after purchasing a Starter Pack. Fixed an issue whereby Shupe's keg opening animation would sometimes lock up and prevent the opening of the keg. The Starter Pack promotion tile is no longer displayed in the Shop for players who have already purchased it. A notification to enable GOG Overlay is now displayed if player attempts to make a purchase with real currency without the Overlay enabled. Fixed an issue whereby cards shown in deck lists might have incorrect card art. Fixed an issue whereby Leader and Game Board skins would reset to default after exiting the game. Fixed an issue whereby the breastplate of Lyrian Cavalry would display in low resolution in the card’s premium version. Fixed an issue whereby items falling from Barnabas Beckenbauer’s cart did not have textures in the card’s premium version. Fixed an issue whereby the sword in the premium version of Elven Wardancer was missing. Fixed an issue whereby the spear tip in the premium version of Rivian Pikeman was missing. Fixed an issue whereby Angoulême’s card art would not appear in deck lists in the Deck Builder. Added a shine effect for premium cards opened in kegs when the Premium Cards setting is disabled. Fixed an issue whereby the card collection progress bars in the Player Profile would not fill completely even if a player had complete collection. Fixed an issue whereby the rewards screen for a completed 9-win Arena run would sometimes not display the Legendary Card awarded. Fixed an issue whereby the volume of board background sounds and Leader effects was not in line with other sounds. Fixed an issue whereby Arachas Queen’s sound effect would not play during the match-start “handshake” screen. Harpy Egg’s tooltip now correctly states that the Harpy Spawned from the Deathwish ability will be Summoned to the same row. Blue Stripes Commando’s tooltip now correctly states that all copies of this unit are Summoned from the deck. Imperial Diplomacy’s tooltip now correctly states that it can Create any card type, not only units. Morkvarg’s tooltip now states that his ability only triggers if he moves to the graveyard during the round. Foltest’s Pride’s tooltip no longer includes Reach. Scout’s tooltip now states that the row effect is removed from the row he is played on. Braenn’s tooltip now states that the player has to control 2 other Dryads for her Zeal to activate. Kambi’s tooltip now correctly states that the opponent discards his rightmost card, not unit. An Craite Marauder’s tooltip now states that the damage is dealt randomly to all other units. Ciri: Dash’s tooltip was corrected in language versions other than English and now states that her ability triggers on turn start. In French, the tooltips of Impenetrable Fog and Biting Frost now correctly state that the row effect causes damage for 4 turns rather than every 4 turns. In French, Ronvid the Incessant’s tooltip now correctly states that he gets Summoned from the graveyard whenever his owner plays a Soldier. In Russian, Toruviel’s tooltip now displays the correct values. In Polish, Lyrian Arbalest’s tooltip now states that he gains a Charge for each card with Order played instead of just units. In Polish, the Ranked Score tab now correctly states that it is visible for players that have reached 25 in rank, not level. Clan Heymaey is now included in the list with the other clan names in the Skellige reward tree within the Reward Book. Is it me or the nerf hammer struck without many(or any meaningful) buffs? So the average deck now will just have less stuff than before? Looks like a clerical mistake. He's still in NR in the game. "Fixed an issue whereby units with Immune would lose that status after being played from graveyard." Does it mean Eredin's immune unit when resurrected will have 'immune' status? Or does this mean units like Alpha Warewolf, Milva, etc will retain their immune status? I sincerely hope it is latter and Eredin's immune units lose the Immune status once they enter GY. I will comment on the rest of the changes once I get to play. Yep, uninspired +-1 changes, called that weeks ago. Nothing that'll make me reinstall the game or fix the games issues. But you know what? After two years of this exact sh*t - I was expecting this exact "update". More or less. Most of the changes look good and the change list shows the full power of the recruit cost system. My only worry is the Bearmaster deck, because it was left mainly unchanged, while its counter has been nerfed really hard. When we will finally see changes easier way, without checking them card by card if we dont know names? Thats one of the bigest game problems. You overload us everytime with alot of buffs and nerfs and we cant see directly the change. Just put pictures of old card and new card with the change or even the option when the mouse cursor stays on cards name to see the picture of card. A lot of people are desorientated of the way you are introdusing changes. The game is great but you are making the same BIG mistake everytime, when you are making card changes. I was playin Gwent from years ago, previous major update changed every card in game and it was very very hard start playin again. It was hard to know what every new card is doing, and it was a mess cause we are seeing old art with new values etc, and just a few weeks after that you are changing again may be 1/4 or 1/3 of the cards and the way changes are introdused is complete disaster. This is permanent problem and it is really huge, cause next time it will be the same again. I hope you realize it. So happy about deck tracker CDPR didn't promise this patch but delivered anyway! And guys - artifacts are still a big problem, pls keep fixing. I assume i wont get my meteorite powder back if i mill premium cards? Yeah, let's nerf the only few good cards NR has. Sabrina is now arguably worse than Lacerate (the only saving grace for Sabrina is that you can spawn Kaedweni Revenant by killing her). At the same time, no significant nerfs to Skellige. Wasn't half a year of Greatswords meta enough? 1 point nerf to the witchers won't solve anything, they need rework. 21 provisions is a lot for 9 points, yes, but they are mostly played for thinning and tempo, and 9 points is still a lot even for a gold card. Generally, as people above already said, this update contains only small balance changes that should've been done weeks ago. Why nerf Filavandrel when no one used him?